I sew many quilts for charity, mainly Quilts of Valor. (When there is another quilter in the family and only one other sibling, there are not many in-house requests, LOL!!) Back in January one of my students asked me to perform in the staff talent show at my high school. Since I prefer to sing in a choir, I thought of a way to showcase my true love. I set up a machine backstage, and introduced myself to the audience and explained that I was going to take the long strip of fabric (prepared jelly roll strips) and turn it into a quilt top. While the other acts performed, I put the pedal to the metal. Phew, I was worried that I would have to stop short due to time constraints, but the show director added one extra song, and I cut the threads just as that piece ended. I had the thought to use both tops to make a reversible quilt, but I talked myself out of that. It seems like cheating when I can easily make two quilts and honor two of our dedicated service members. My traditional jelly roll top finished at 51×63, which is too small for QOV (they request a minimum of 55×65, and the preferred size is 60×80). So, I found some red fabric in my stash and added another 2″ border and on my last shopping spree I found that great navy blue dotted fabric. I loved it so much I bought the end of the bolt, about 2.5 yards!! 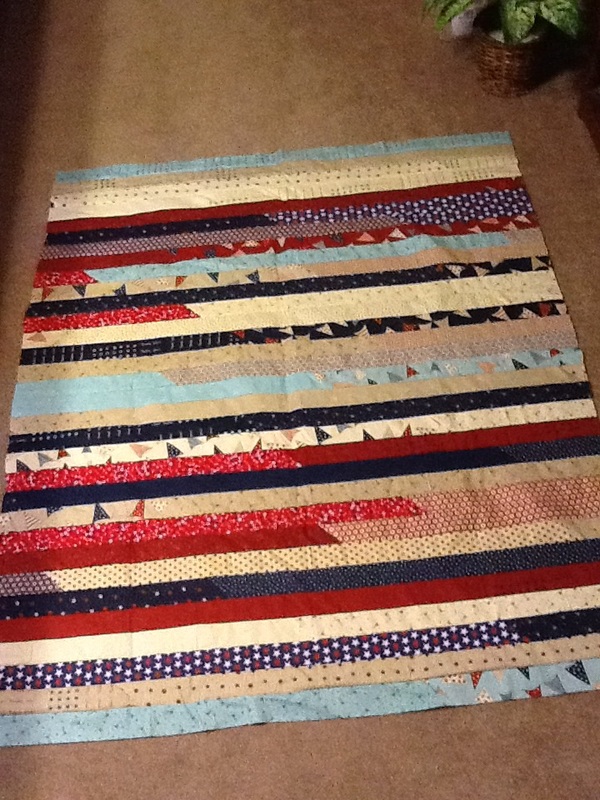 I am adding a 4″ border of blue so the quilt should end up about 63x 75. I will have to dig deeper in the stash to find pieces for a backing, and then I have the perfect pantograph in mind for the quilting. I hope to have this done in a week or so in order to share it with the students who organized the staff talent show before school ends. By the way, I got a cute Santa trophy for “Most Unexpected Talent.” It was a fun night!